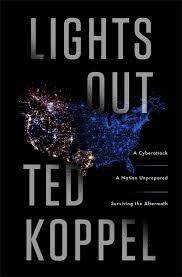 Reading Lights Out by Ted Koppel, reminded me of Cormac McCarthy’s post-apocalyptic novel, The Road. McCarthy writes fiction, some would call it science fiction, but Lights Out is a 279 page, real life wakeup call filled with expert testimony, solid research, and examples of what would happen if the United States experienced a major cyberattack. One of the scariest parts of this book is that some major US cities have already had massive blackouts. Several high security government agencies have also had their computers hacked (Office of Personnel Management), as have large corporations, including Target. Yet many higher-ups in government and industry remain poorly prepared for a cyber emergency, and some officials are in denial that anything catastrophic would ever occur. Currently, three electrical grids provide power to most of the country. To operate, the grids need massive generators in good working order. The existing ones are aging and new generators take years to build, plus they can weigh up to 900,000 pounds, so transporting one becomes an enormous undertaking. Ideally, the military has generators secretly secured in unknown places. Those would be used for rescue and restore operations. People in high-rises or dense urban neighborhoods would have the most difficulty. Based on Koppel’s findings, those who are best prepared are survivalists and people who live off the grid and are always prepared for the worst. Koppel lays out some worst case scenarios and shows us what will happen if all our food goes bad, water stops flowing from faucets, waste systems quit working, looters roam the streets, people start dying and law enforcement struggles to maintain order. The only thing that keeps the reader from the total despair, in my opinion, is Koppel’s calm and professional journalism, because make no mistake, this is a real life, pre-apocalyptic horror story. I happened to be reading Lights Out during the battle between Apple and the FBI over the locked iPhone that belonged to the California terrorists who killed 14 people in San Bernardino. If the principals in that fight haven’t read Lights Out, they should.